In 1066 William the Conqueror and his troops, including Channel Islanders, brought the Norman language to England by force and claim of succession, but in the twenty-first century Norman voices still express the special cultures of these remnants of the Duchy of Normandy. The Toad and the Donkey brings together texts in the Norman languages of the Channel Islands, along with other texts that illustrate the tangled linguistic heritages of what Victor Hugo, in exile in the Islands from 1852 until 1870, called ‘pieces of France fallen into the sea and picked up by England’. In 1066 William the Conqueror and his troops, including Channel Islanders, brought the Norman language to England by force and claim of succession, but in the twenty-first century Norman voices still express the special cultures of these remnants of the Duchy of Normandy. From Jersey’s earliest known poet, the twelfth-century Wace, who was the first to introduce the Round Table to Arthurian legend, to the inspirational nineteenth-century revival in Guernsey and Jersey, as well as writing from the twentieth and twenty-first centuries, The Toad and the Donkey explores themes such as economic expansion across the Atlantic to North America and elections at home; love and limpets; witchcraft, war and women’s emancipation; slave-trading and seaweed. For the first time, texts from Jersey, Guernsey, Alderney and Sark have been selected and translated in order to illustrate how writers from the Islands have been inspired by each other, and by overseas influences. This literary tradition has been neglected, fitting neither into the comfortable categories of British literature nor French literature, but like the Channel Islands themselves, sitting somewhere in the currents which flow between both. Geraint Jennings is an artist, writer and teacher. As one of the team at L’Office du Jèrriais, the Jèrriais promotion agency, he has designed Jèrriais teaching materials for schools. Twice winner of the Grand Prix for a short story in Norman, and recognised in other writing competitions, he has written for commissions, and some of his pieces have been chosen as set texts for the Jersey Eisteddfod. In politics, he has served as an elected member of the municipality of the Parish of Saint Helier for a number of years. Yan Marquis is a language enthusiast and a founder member of the language promotion organisation ‘Les Ravigotteurs’. He learnt Guernesiais as a second language from close family and friends and has since become involved in its teaching and promotion. In 2008 he moved from a career in IT to become Guernsey’s first Language Support Officer employed by the States of Guernsey. Lesser-used languages of the British Isles cont. We believed we had covered them all: Cornish, Manx, Welsh, Romany, Scoots, Irish Gaelic, even St Kilda Gaelic. Our personal criterion for a “living language” is the existence of poetry, or something resembling it. Along the way, we mentioned Channel Islands Norman French, the most remote of our lesser-used languages. car j’vai qu’les crapauds sont sortis! car j’entends les ânes braithe! If there are readers who speak or write in these dialects, we would like to hear of it. 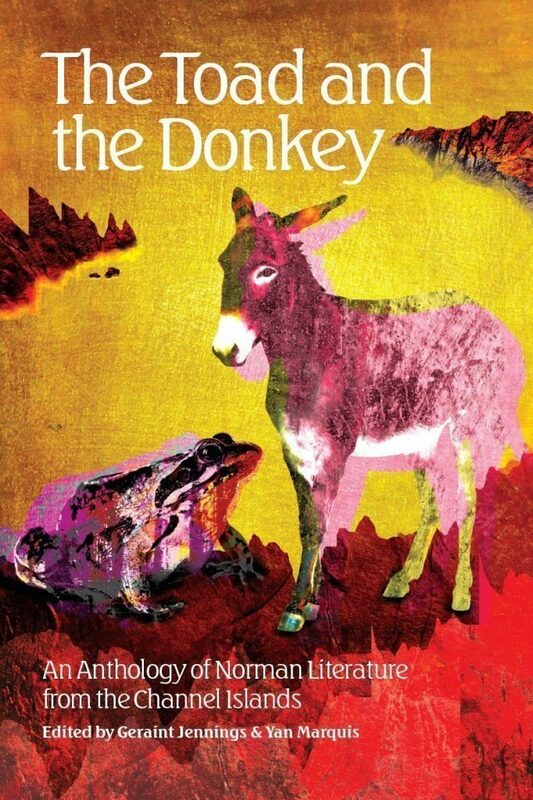 The Toad and the Donkey (£19.99) is edited by Geraint Jennings and Yan Marquis.